They are comparable, where the bespoke attachments are often more secure due to the precision manufacture and choice of materials. Because of the mechanical burden through rotational and tilting forces, there is a risk of deformation and breakage. Bar connectors are primarily seen as locking and therefore stabilising elements. They are frequently used in combination with implants. The main disadvantage of the bar connector is the difficulty in cleaning and thus an increased likelihood of inflammation of the gingival tissue. Bar connectors also require more space and this provides the dental technician with additional challenges (1, 2, 3). The flexibility for future expansion or adaptation of the prosthesis is also limited when compared to telescopic attachments (1). An ideal retaining element is the individually produced or ready-made swinging hinge. It enables friction-free insertion and removal of the denture. In the locked setting the detachable denture section is fixed securely using a swinging hinge. The advantage of the bolt or key slide prosthesis is the pressure-less attachment, similar to an interlock, of the prosthesis to the pillar teeth. These are consequently not exposed to damaging forces during the insertion and removal of the prosthesis. The disadvantage is the elaborate construction and the frequent steric problems for the placement of the bolt. Additionally, the bolt requires considerable manual dexterity on behalf of the patient! This article provides an overview of a wide variety of European answers to providing cost effective and aesthetic solutions for patients using precision connecting elements. 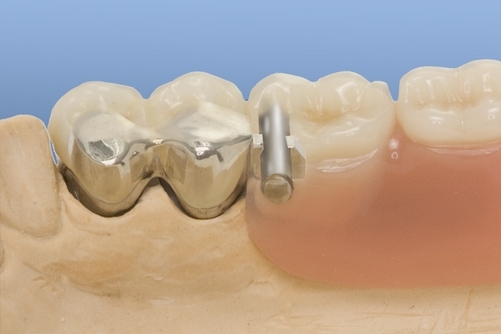 Precision milling bridges the gap between conventional dentures and pure implant solutions and give the dental practitioner a wider toolkit to match individual circumstances, taking into account no only the physical oral environment of each patient but also their financial and aesthetic aspirations. Each type of precision connecting element – telescopic, attachments, bars and bolts or key slides – has its own unique features in preparation and application. It is my intention to consider these in more detail individually in future articles if the reader is interested. The manufacture of a perfect prosthesis, one that is not perceived a foreign body in the mouth by the patient, requires great mechanic skill from a dentist and dental technician. Only the close interaction by both specialists delivers the desired result for the patient. attachments, bars, bolts, claps, conventional dentures, Dental, dental crown, dental Laboratory Ulrich Heker, dental Telescope, dentures, double crown, Extracoronal Attachments, German Crown, implant, implant solutions, interlock, Intracoronal Attachments, key slides, precision connecting element, precision milling, Removeable dentures, Teethrus, telescope, Ulrich Heker. Lesezeichen.